The Amateur Athletic Union (AAU) was the governing body of all amateur sports from the late 1800s to the 1980s. The sport of Cross Country ( Track & Field) was overseen and organized by the AAU. Distance running has always been popular in the City of Philadelphia and the Mid Atlantic area. In the early days, many local neighbrohoods had athletic club for junior and senior men and with many of the stronger ones being faith based clubs. Clubs such as Shanahan Catholic Club (42nd and Lancaster Ave), Nativity Catholic Club (Port Richmond) won many of the championships in the early years. Strong clubs where also based from industry (such as Meadowbrook Club sponsored by the John Wanamaker Dept. Store), and athletic clubs (Mercury, Germantown Boys). Many of the AAU Cross Country Championships for the first 40 years where actually "Road Races" by today's definition. All races in the early days had between 30-200 runners were held under the AAU and in order to compete in local races, runners where members of local clubs that were members of the AAU. The annual Mid Atlantic AAU Senior CC Champs for 19 year old males and older, was organized by the local club and run on neighbrohood streets (mostly in Philadelphia) and overseen by the AAU and it's officials. Throughout the year from 1900 to 1950s, many of the local CC races where "handicap" runs with the championship CC in late November or Mid December, with all AAU members starting from scratch. The local club took great pride in winning the annual championship. Many Olympians cometed in the annual championship with the most famous runner being Browning Ross (1948 and 1952 Olympic runner and National AAU XC Champ, who ran for Villanova University and won the race 12x). Browning Ross later founded the Road Runners Club of America. Other great champions were Joe Barry, Davey Wright, TomDonnelly, Vic Zwolak, Chris Mason (members of championship teams at Villanova), Herb Lorenz (member of National USA Team in CC), and Rich D'Sebastian (2x Philadelphia Marathon Champion). Championships sometimes were held outside Philadelphia and run in the New Jersey or Harrisburg area, but the annual championship was help primarly in Philadelphia and Fairmount Park. In the 1940-1960s, some of the stronger clubs where Shanahan (coached by Jack Pyrah, who later became long time assistant at Villanova) and Penn AC (Jack Saint Clair, Sr coached the club). Belmont Plateau continues to be the central venue for cross country and the Mid Atlantic Association of the USATF continues today with cross country championships for it's senior/open (19-39), master (40 +) and women racers. Below is a list of Senior Championship results and in more modern times, champions from the AAU/MAUSATF Cross Country Championship. Results and details were supplied from newspaper articles from the Philadelphia Inquirer. 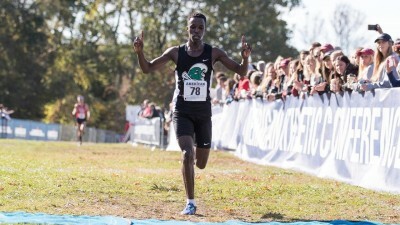 #Course record for 10,000 set by Paul Stemmer, broken 1 week later at the National AAU Cross Country Championships by Ric Rojas (Colorado TC) by running 30:23.8. This 10,000 meter still stands as the fastest 10,000 meter ever run at Belmont Plateau. This course included all the major hills of Flagpole, Parachute, Surekill and Nursery Hill.